SUBSTITUTIONS: Free substitutions in the field. Everyone kicks. FIELD: Lined with same dimensions as regulation softball field with a few exceptions. EQUIPMENT: Played with a regulation 10” playground ball. Players must wear their LXC team shirts. INNINGS: A regulation game is 7 innings or 60 minutes, which ever comes first. At 50 minutes the last inning will be called. SCORING: A tie game after 7 innings will be declared a tie unless, time permitting, both captains and the umpire agree to continue play. In the event that the game goes into overtime and the lights go out at any point during the inning, the game will be called a TIE even if the away team is ahead. ALCOHOL: Smoking and alcohol are forbidden. We use public youth fields for many of our leagues and it is illegal to use tobacco or alcohol on the property. Outfielders must be at beyond the outfield line until kicker makes contact. Ball must be thrown underhand. Ball must bounce at least 3 times before crossing the plate. Pitcher must have one foot on the center line when releasing the ball. Runners must run to the safety bases at 1st and home. An out will be awarded if the runner does not tag the safety base at home. 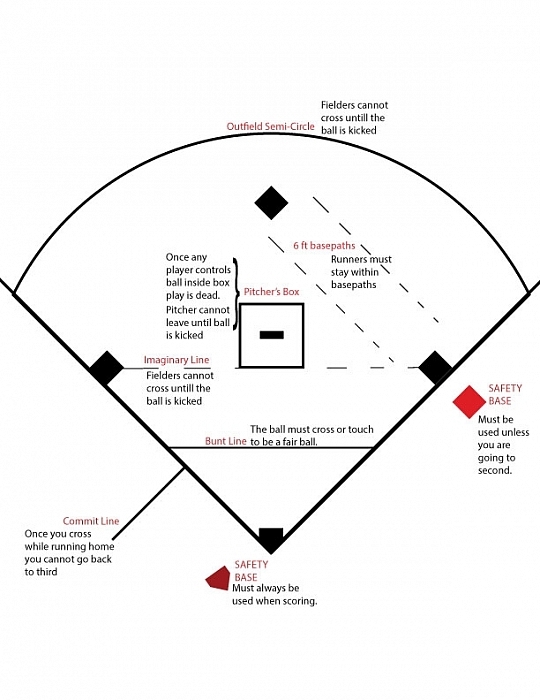 Safety Base at First Base must be used whenever the ball is kicked into the infield or if there is a play at first base or the runner will be called OUT. If the ball is kicked into the outfield then the runner may use first base to round the bag to second base. In this case, the first baseman must move off the bag to allow the runner to round first otherwise it will be called obstruction and the runner will automatically be called safe at second. there are 2 outs and a runner crosses home plate before or after a force out at another base, the run does not count at home. Runners may tag up as in softball as soon as the kickball is touched by the fielder. Runners do not need to wait until the ball is completely caught as balls occasionally will bounce up in the air off the fielders. If a runner intentionally runs into a fielder, or is out of control when running and runs into a fielder, they will be called OUT. This is completely up to the discretion of the umpire and may not be argued. The run rule does not take effect until a team is winning by 7 or more runs. It is never in effect for a team that is losing. Once a team is up by 7 the following inning the max they can score is 6, then the next 5. The run rule stays at 5 until the end of the game or the opposing team closes the margin to 7 or under. If the score is less than 7 runs different at any time the run rule goes back to 7. Payment is due in full by noon the day after your first game. Remaining balance will be charged to your card at that time. Any teams not paid will not be added to week 2's schedule. We do our best to start all leagues as initially scheduled. Every league needs at least 4 teams to start. If there are not 4, a league will be pushed back 2-3 weeks in hopes of adding enough teams. We will notify you as soon as their are enough or if the league will be postponed again. At any point after a league is rescheduled, refunds can be issued upon request. Week 1's schedule will be released at least 3 days prior to the start date. After week 1's games the full schedule will be out. After week 2's games no schedule requests will be taken. Schedules are subject to change due to weather, field availability, or other unforeseen issues. A team shirt will be given to each player that is on the roster at least 3 days prior to the start date. Players not on the roster by that time may have to make arrangements to pick one up at the LXC office. Only players on the online roster are eligible to play. Rosters will be frozen after week 3's games. After that, all additions will have to go through the LXC office. Subs are allowed and should be added to the roster accordingly. Subs for the tournament must be approved by the LXC office. If you forfeit you are cheating a team out of a game that they paid to play. Please always make every effort to get enough players to the game. Even if it is not a full team we can make a game happen. If you must forfeit please let us know ASAP so we can do our best to get the other team game. Multiple forfeits may result in an extra fee.